Both State and Federal guidelines apply to how you’re waste is handled, transported and destroyed. And compliance is not an option.Your company is legally responsible how your medical waste is disposed of from “cradle to grave”. This means if you have a medical waste disposal company that picks-up, removes, and transports your waste, and then treats your bio-waste at an off-site waste processing facility, your company is still responsible. This will keep you and your employees in compliance with Federal OSHA Regulations. Rules and regulations do not always dove-tail with one another. Which rules or regulations are “primary” or “secondary” may have to be determined by the courts. They issue written “rulings” describing the hierarchy of responsible actions by third parties, the ones who must act accordingly. Medical waste managers need to be aware of multiple levels of governmental control. Common sense is not a component in describing required actions by statute, regulation, rule, or rulings. The federal and state governmental structures may have similar or dissimilar “regs,” that will automatically bring judicial review. The astute manager may wish to delay specific actions until such review is completed. Congress enacted the Medical Waste Tracking Act of 1988. It defined medical waste as "any solid waste that is generated in the diagnosis, treatment, or immunization of human beings or animals, in research pertaining thereto, or in the production or testing of biologicals." The definition is quite broad, taking in everything from blood on Kleenex and needles and lancets to lab culture dishes to paraphernalia used in invasive procedures harvesting body parts and organs. 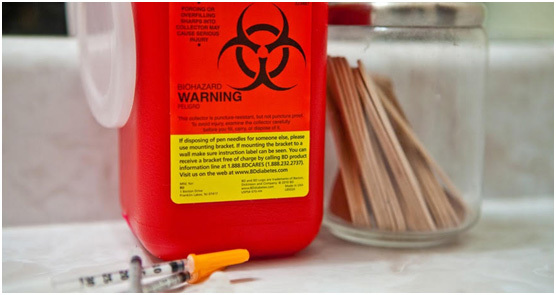 EPA zeroed in on “sharps” as a first interest in biohazard waste disposal control. Loss of control of discarded needles places health, public, and waste handlers at risk from needle stick injuries and potential infection. These regs took effect at the time of national concerns about HIV and hepatitis. “The Community Coalition for Safe Community Needle Disposal” developed a strategy for dealing with needledisposalusing drop boxes or special sites for needle collection, mail-back programs, syringe exchange programs, and special destruction devices. By 1990 EPA was examining the efficacy of incinerator, autoclave, microwave, chemical, and mechanical technologies for managing disposal of biohazards. Rampant Ebola in areas of Africa caught the attention of the world in 2014. Necessity for proper medical waste management in patients suspicious for the disease became apparent. The CDC did lots of teaching about biohazardous waste disposal. 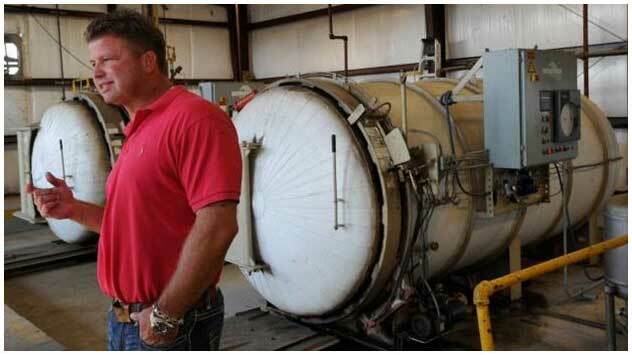 Incineration and autoclave are used for Ebola to reduce health risk. “Neutralized” waste could be handled then as a non-hazardous waste. The concept of neutralizing medical waste and converting it to “ordinary waste” has worked its way into thoughtful medical waste management. OSHA is concerned with workplace environment. It facilitates resolution of workplace hazards to protect workers. It has developed a “Bloodborne Pathogens Standard,” a “Hazard Communication” related to hazardous chemicals in the workplace, etc. for medical and dental offices where bio-waste is a central concern. Medical waste directly impacts disease and the management of disease sequelae. EPA looks at that waste in the environment. CDC looks at medical waste from its infectious threat. OSHA looks at the worker in the environment that generates that waste. Control of medical waste requires panoramic vision, because environment, specific disease, and exposed people are all impacted by medical waste management. Each agency must work along with the other two. Disposal criteria differ from state to state and are based on the amount of biohazardous waste generated over a given time period. The workplace manager must begin the task of disposal by determining the amount and kind of waste produced and where it ultimately ends up. For example, each hospital bed generates 33 pounds per day. Waste may end up in landfills or in medical waste incinerators. Waste in landfills generate methane. Waste in incinerators may generate fly ash along with heavy metals, dioxins, HCl, etc. Pharmaceuticals pollute our country’s waters. Categorizing the type of waste and the costs of disposal for each type allows the manager to choose how to reduce, alter, or otherwise control the amount of waste generated. All this must occur within the regulatory scheme of the state in which the health-related company operates. Medical waste grew in amount and complexity in the Twentieth Century. Syringes and needles were first used for vaccinations and inoculations (e.g., small pox vaccine, penicillin, etc.) on a large scale. With control of infection, surgery became a viable option for control of a variety of physical maladies. Today we take Botox injections as a simple procedure, skin cancer removal in the doctor’s office as routine, etc. Congress saw “mountains of medical waste” being generated in the country and developed legislative and regulatory strategies to establish medical waste disposal methods. Our federal government was initially slow to move to address the problem. Canada and other countries were already employing methodologies for management of medical waste. Congress began to initiate legislative and regulatory control. The administrative component of our federal system grew dramatically as it was given resources and personnel to carry out the legislative mandates. The courts were soon involved, because intra- and inter-agency and federal-state jurisdiction dilemmas soon surfaced. We are now about thirty years after most initial legislation, implementation, and judicial actions and forty years after “The Resource Conservation and Recovery Act” which first brought federal control to solid and hazardous waste management. Medical waste is a small but important component of a larger waste management agenda. Why We Need To Manage The Biomedical Waste In The Right Way? Environment pollution– The risk of air, water and soil pollution directly from waste due to defective incineration or autoclaving can be harmful. The OSHA (Occupational Safety and Health Administration) has an established procedure for dealing with biomedical waste hazards that can minimize our risk with contaminated articles. Thus, we at BioMedical Waste Solutions, LLC, use OHSA standards as our guidance to dispose the medical waste properly. Federal jurisdiction discussion is voluminous. Actual “control” and biohazard waste disposal occurs on the local or state level. If we focus on “Medical Waste Disposal Texas” as an example of state management, we find similar legislative, administrative or regulatory, and judicial strategies. Actual rule making is primarily under the authority of the Texas Commission on Environmental Quality. Companies are termed “generators of medical waste” and “must identify and segregate medical waste … from ordinary rubbish and garbage…. Where medical waste and other municipal solid wastes are combined, the combined waste shall be considered to be medical waste.” Such waste can be moved off-site, but transporters must be “registered with the executive director to transport untreated medical waste.” The generator of the waste must maintain a paper trail of all receipts for shipments and maintain that roster of shipments for three years from date of shipment. There are specific rules for labeling, containers, and transportation rules specific for certain types of medical waste. A generator may be considered “on-site” or “off-site” for management of medical waste, with different disposal rules required. Licensed facilities may serve as collection stations for other medical waste generators. 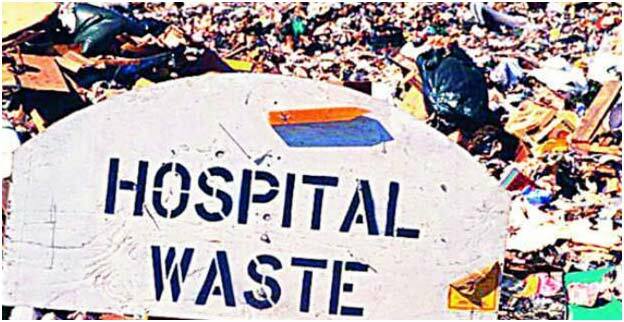 If the facility is a hospital, its community must be less than 25,000, and it must obtain a municipal solid waste Type V registration. Medical waste may be stored prior to disposal as long as waste is secure and not a nuisance. Untreated medical waste may be transferred between transportation units, e.g., authorized facility, transfer station, storage facility, processing site, etc. Facilities are required to have the MSW Type V registration as transfer stations. Registration is dependent on municipal and county population and the amount of material processed daily. A hospital may serve as a collection site for generators that produce less than 50 pounds of untreated medical waste per month and that transport their own waste. Recognize that generators may neutralize medical waste on-site. What might appear initially as volumes of waste for transport, may have been reduced dramatically by simple autoclave, etc. Additionally, Texas requires that a minimum of 10% of waste materials must be recovered somewhere in this processing and transportation process. Whether or not a facility seeks credentialing for medical waste management by itself, there are application procedures (Form TCEQ-0650 and Form “Type V Medical Waste Transfer Facility Checklist”). Responsibilities differ based on whether the medical waste is treated and placed in routine municipal refuse or is untreated (TCEQ-310). 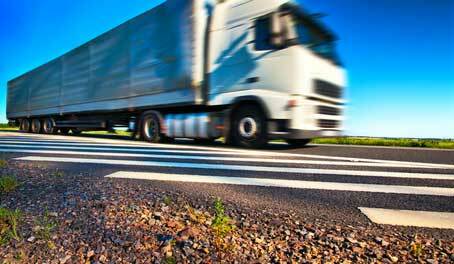 All biohazardous material transportation must be accomplished by appropriate transporters. Company must assess its need and its medical waste collection, storage, and disposal methods. If it generates little medical waste, it may contract with a local facility like a hospital to manage medical debris. Given the paper trail necessary for management of medical waste, however, many companies may wish to have a contractor facilitate services. This is true for small generators like doctor and dental offices as well as large clinics, nursing homes, and hospitals. Itinerant clinicians will especially need help in managing home-based visits where biohazardous procedures occur on a variety of sites, necessitating containers and transportation of hazardous materials. An industry has grown in the shadow of legislation, regulation, and rule-making mandating disposal of medical waste. A simple browser search via internet will produce a myriad of waste management providers. A few companies specialize in the medical waste disposal management of biohazardous materials like medical waste, radiation isotopes, human and animal parts; they have developed all over our nation since those early days of recognition of the problem of hygienic disposal to preclude contamination and spread of disease. These companies will assess need and assist medical waste generators with planning the how of medical waste removal, the establishment of a paper trail for waste that brings the generator into federal and state statute, regulation, and rule compliance and which will help develop an OSHA compliance strategy. OSHA typically seeks to eliminate hazards or engineer an answer to them or protect employees from the hazards using various protective gear for the workplace. Waste removal is not instantaneous. Waste is generated and collected by a company. The waste must be collected and stored prior to processing on-site or shipping to a central medical waste collection and processing site. If an on-site incinerator is part of this process, containers may be consumed in the incineration. If the container is to be used again, the container may need to be washed and autoclaved. If the container is to be handled by human hands, reasonable container rigidity and penetration resistance must be assured. Hands-free containers are desirable. Containers may be as simple as a bag or as complex as a large shipping container with multiple bins. Companies serving disposal needs often itemize containers on their websites, but company managers must look for containers that meet biohazard criteria since they bear responsibility for meeting transportation regulations. Not all facilities have this due to major infrastructure expenditure, but it is generally cost effective for very large hospitals and laboratories. Equipment contaminated by biohazardous material will need to be decontaminated. Before purchase of any equipment to be used in the movement or processing of waste, evaluation of equipment for ability to be cleaned thoroughly needs to be fully examined. Consultation with providers specializing in this area is advised. Compliance with federal and state regulations is indicated. Certification, registration, or licensure is necessary in medical waste disposal to assure that the letter of the law and necessary documentation in completed. A reputable service provider will use qualified personnel, fully vetted safe disposal sites, and spell out specifics for controlling cost. Companies serving hazardous waste disposal needs will offer a menu of services, as with BioMedical Waste Solutions, for example. Properly disposing of your medical waste prevents infections and diseases from spreading, and keeps our earth clean. Please share this website and the following infographic. 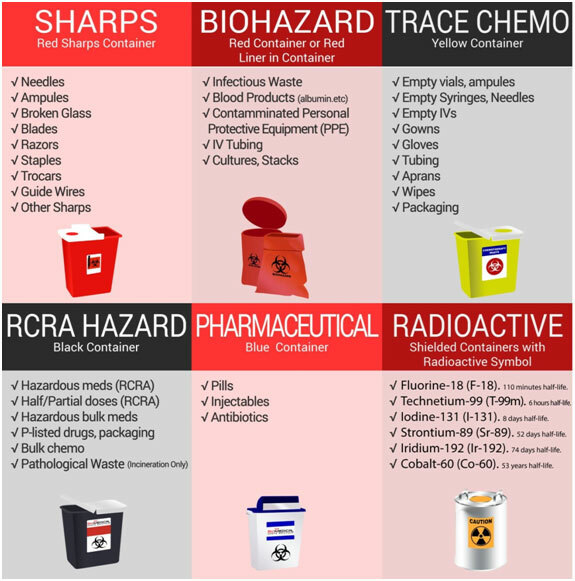 Infographic courtesy of http://www.BioMedicalWasteSolutions.com/Medical-Waste-Disposal/ and the Medical Waste Disposal – The Definitive Guide.